VANKLEEK HILL, ON – Beau’s All Natural Brewing is a brewery well known for their support of local charities, and their latest beer release adds to that reputation. My Community Brew is a new beer released in time for the holiday season, and more notably, 30% of all sales will be donated to United Way Ottawa to support their good works in the community. A ‘saison’ style beer, “My Community Brew” originates from Wallonia, Belgium and was traditionally brewed during the harvest and served up when everyone would get together after a hard day’s work in the fields. It’s thirst quenching, snappy, tart, crisp and certified organic. It features spicy fruitiness with earthy undertones and has been brewed with lemon and orange peel to provide citrus aroma and flavor. 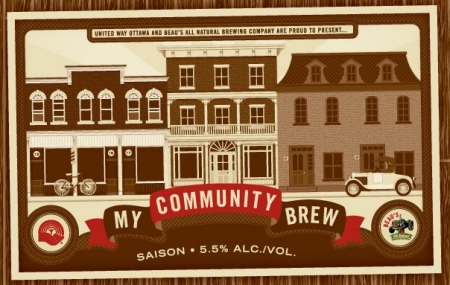 My Community Brew is available now in the retail store at the Beau’s brewery.